Indianola is a great place to live. It provides the safety and community of a small town without being so small that you see the same faces every day. According to the 2010 census, the population of the city is 14,782. You can purchase a great home in Indianola for as low as $200,000. Their houses in the city are reasonably priced and are a great value for the money that you spend. When you start looking at the Indianola homes for sale, you won’t be disappointed. They are beautiful homes that have all of the modern features you would expect in a house. The city is growing, so you can expect the value of your home to increase over the years. So what’s so great about Indianola? There is so much to do! Do you enjoy the outdoors? Walk through parks, fish for trout, and bike down trails. Need some entertainment? Watch a movie, skateboard, or head to the lake. Hungry? Explore the variety of delicious restaurants in the area. There is something for everyone in this city. Whether you live alone, with your spouse, or with your entire family, you will find many exciting things to do that will make everyone happy. There are tons of social events that will allow you to meet new friends and witness new things. One things for sure - you will never be bored in Indianola. 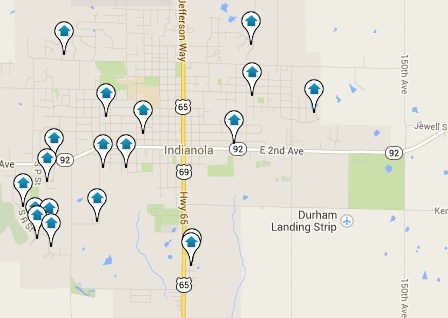 We highly recommend looking at some Indianola homes for sale. We are confident that you will fall in love with one of the exceptional homes that are available for a cheap price. Life’s too short to live in a city that you don’t like. Many people visit Indianola and fall in love with every aspect of the area. They “set up camp” here and never leave. Chances are, you will also greatly enjoy the things that this city has to offer.